That's me, thirty-two years ago. From the look on my face I'd say I was nearing the south end of the 24 mile long Lake Pontchartrain Bridge. I don't remember my time for that marathon, but so far my fastest marathon time is 3 hours 36 minutes and that came a few years later in Memphis. That means I probably finished the 1982 Mardi Gras Marathon in 4 hours 45 minutes. 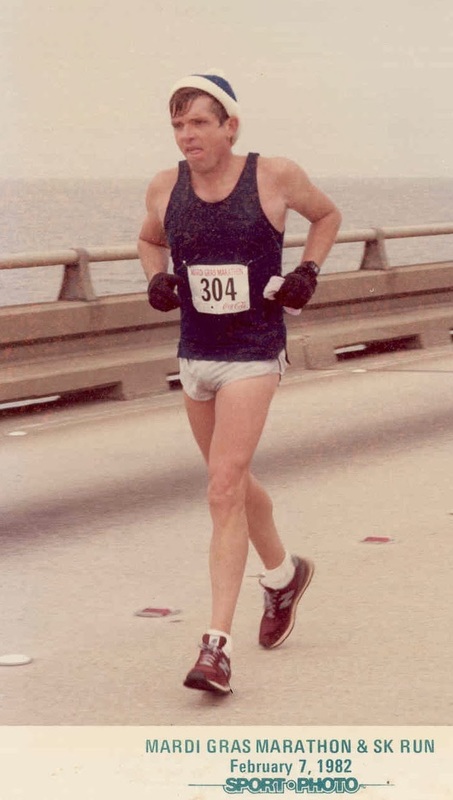 The photo was taken Feb 2, 1982, 32 years ago when I was in my 3rd year of running. Today, I'm still a runner. I don't run with large groups of people toward signs that read, "Finish Line." Mostly I run alone, at night, and my target pace is 14.5 minutes per mile, which works out to over six hours for a marathon, if I were running marathon distances, which I'm not. So, obviously, I'm not getting faster, in fact I'm quite a bit slower than I was in those days. What you can't see in that picture is that I was hurting, seriously hurting, although not nearly as bad as I had been hurting the year before at the same time and in the same place. Also what you can't see in that picture is the day days following the race when I could barely walk. So, in 35 years I've learned this life thing isn't a 26.2 mile race. And if you believe, like I do, that we were somewhere before we came here, and we are going somewhere from here, then you know life is eternal and has no beginning or ending. Life is from the beginning of time to the end - and probably some after that - but who knows. If we focus on maintaining speed and appearance for the short haul, we are only guaranteeing our appearance in the next chapter before we had planned. A couple of days ago, my buddy, Ralph Miller reminded me of that with the gift of two great videos - the Spaniels singing Good Night Sweetheart in 1954 and again in more recent times. By the worlds standards, they looked "better" in '54, but by anyone's standards, they sounded so much better fifty years later that the difference cannot be measured. So, what's it going to be? Flash bang, or all the way, getting better with every step, every breath, every year?